The engagement party might be for the happy couple, but don’t forget the guests! 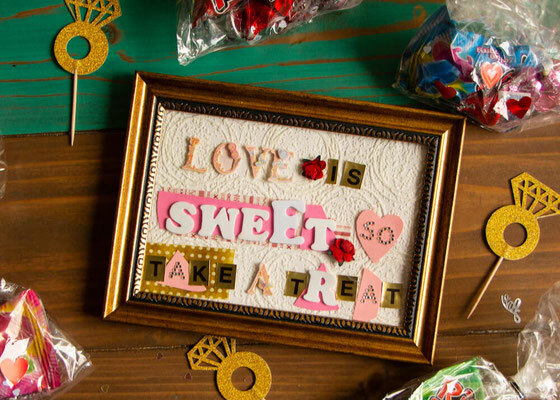 Show your love and appreciation for people who celebrate you with these easy-to-make (and edible!) 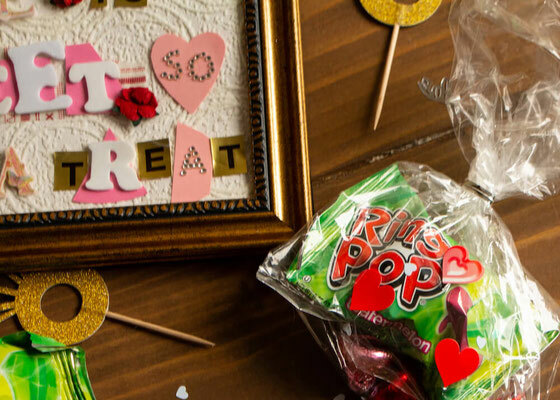 DIY engagement favors. Since Lawrence and I got engaged (with such a sweet proposal!) a few months ago, we’ve been knee deep in research mode, thinking about all the options for our big day. I have to admit, I at first went pretty crazy into the research, contacting a few hundred (yes, a few hundred!) venues all around the world. More on that soon, I promise! Before we put our wedding plans into stone, we wanted to celebrate our engagement with our closest friends and family. Because our nearest and dearest live all over the country—but primarily in Florida, where I grew up, and in the New Jersey and New York City area, where we live—we decided to have two parties! Why not?! And of course, I can't host a party without giving each guest an engagement party favor! 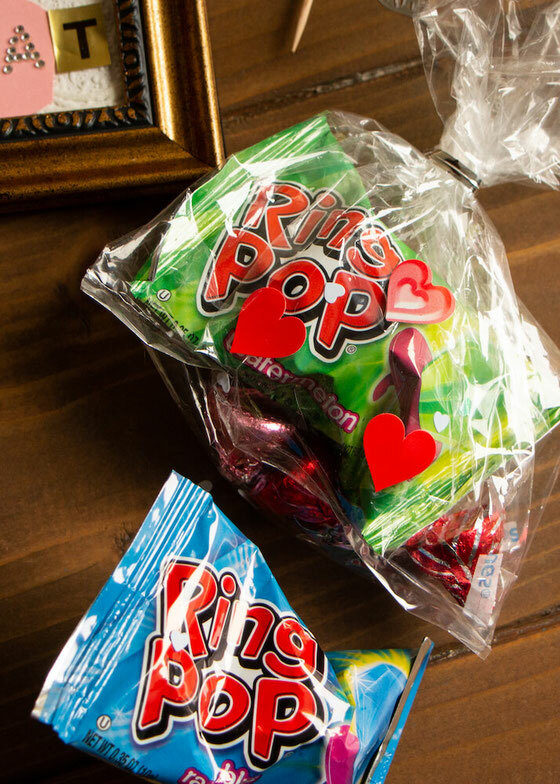 These engagement favors are budget friendly! Also see how Lawrence and I planned an engagement party on a budget! My parents are throwing us one in my hometown later this month. And Lawrence, I, and his parents hosted a local engagement party this past weekend at our apartment! We wanted to keep it pretty casual and easy, so we ordered catering from a local Dominican restaurant and bought appetizer platters and a two-tier cake from Sam’s Club. Even though things were on the easier side, I don’t have it in me to host a party without crafting at least one thing! So for this party, I made engagement favors for each guest. Of course, before I got crafting, I Googled and searched on Pinterest, and posted on Facebook for ideas for favors. What I came up with is pretty simple to put together, so I want to share it with you all in case it sparks inspiration for any future party planning! The best part? Each engagement party favor cost less than $1 a piece (about $.50-$.60 each). I’m a bride to be on a budget, so every dollar counts! You might recall the wellness gift bags I made to hand out to pals at a holiday party. The favors I made for our engagement party have a similar look. You can buy these at many locales, but I found the best deal to be a pack of 25 for a buck at Dollar Tree. You can also grab this pack from Amazon. I was hoping to find gift bags with hearts on them, but no dice. So I took things into my own hands and used my childhood sticker collection to decorate the bags! You can find similar heart stickers on Amazon. 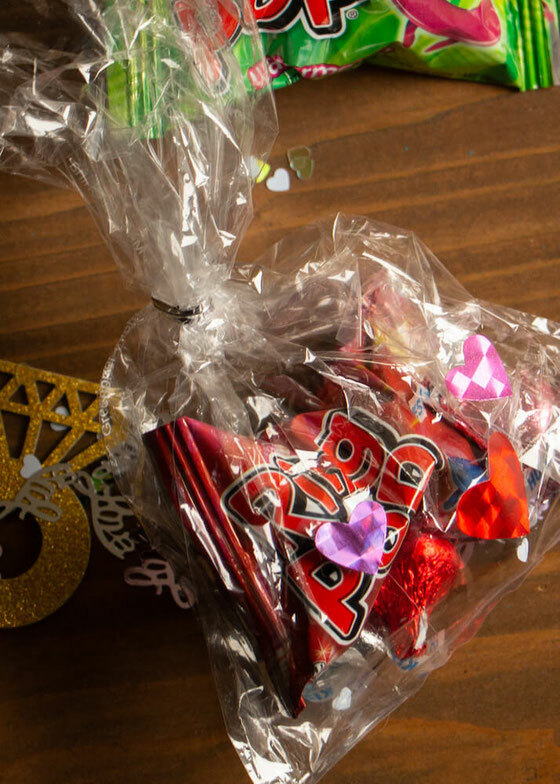 What’s a party favor without some personal touches? I bought a cute love-themed confetti pack from Party City as a decoration for the party. I knew there would be some left over, so I sprinkled a handful of confetti into each gift bag. I also like this engagement ring confetti from Amazon. Right after Valentine’s Day, I dashed to my local CVS for the half-off sale. I wanted pink, red, and silver hearts—and what better way to score them than to buy them on sale? You can buy pink Kisses and red and pink Hugs year-round at Amazon. I thought this would be cute and punny. And Dollar Tree came through again, as I was able to buy a four-pack of the pops for a buck. I saw them for triple the price at a local Michael’s! You can also buy a big pack of ‘em at Amazon. And there you go! 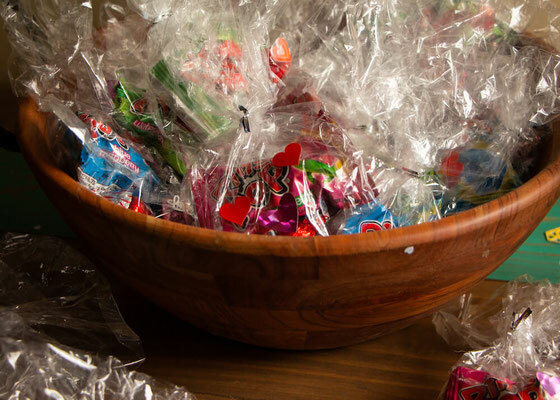 I styled the favors in a bowl (which was an engagement present from friends) by the door, next to a “love is sweet, so take a treat” sign that I’d created. I’d seen similar signs on Etsy, but since I like to make things I figured why not try my hand at making my own. I bought a gold 5” x 7” frame at the dollar store and used my stash of craft supplies—scrapbooking stickers and artisan paper I’d accumulated over the years—to make the sign. I hope this easy budget-friendly, DIY idea for engagement favors helps your engagement party planning! I can't wait to hear about your own DIY party favors. I'd love for you to sound off! 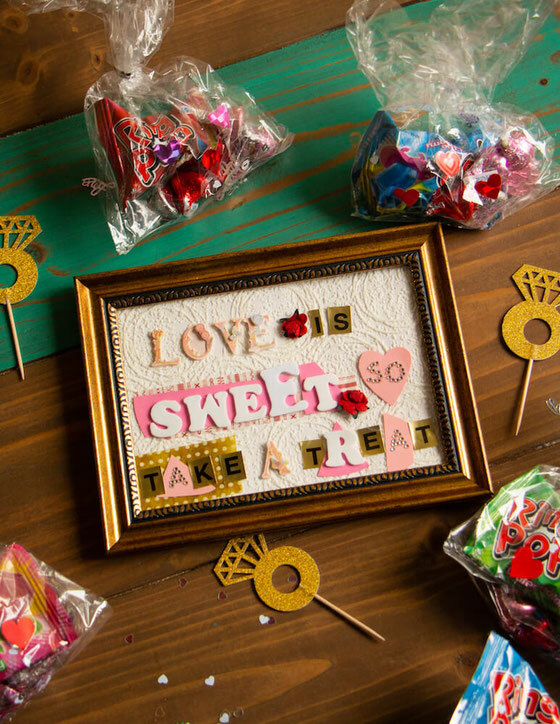 What ideas do you have for easy DIY engagement favors?